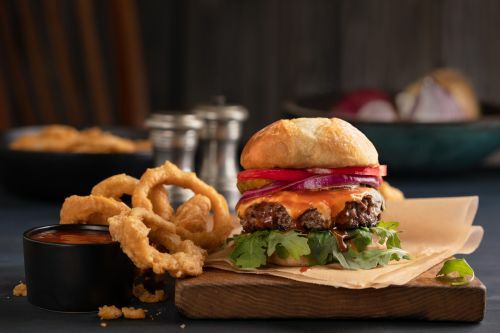 Menulog delivers for Burger Foundry - Torrensville so you'll be able to track your courier on a map. Super Slider = Smaller burger, served with small chips. Medium spiced. Caribbean seasoned, grilled chicken thigh fillet with thick tomato slices, sweet tropical mango salsa, aioli, and iceberg lettuce. Grilled chicken thigh fillet with creamy avocado slices, cucumber slices, thick tomato slices, buttery brie cheese, aioli, and mesclun greens. Spicy grilled meat patty, spicy chipotle chilli, tomato salsa, smoked barbecue sauce, cheddar cheese, aioli, and mesclun greens. Grilled meat patty with sweet beetroot slices, thick tomato slices, crispy smoked bacon, sunny side up egg, Beerenberg’s relish, matured cheddar cheese, aioli, and mesclun greens. Grilled double beef patty and double American cheese. Topped with fresh onions and pickles, finished with mustard and Foundry tomato sauce. Grilled meat patty, thick tomato slices, cheddar cheese, aioli, and iceberg lettuce. Grilled chicken thigh fillet, thick tomato slices, aioli, and iceberg lettuce. Grilled Aussie black Angus Steak Burger. Topped with crispy bacon, caramelised onions, tomato slices, Swiss cheese, aioli, and mesclun greens. Served medium unless requested otherwise. Grilled meat patty with sweet caramelised onions, thick tomato slices, crispy smoked bacon, matured cheddar cheese, aioli and mesclun greens. Grilled meat patty with roasted walnuts, sweet caramelised onions, blue cheese, aioli, and mesclun greens. Grilled meat patty with sweet caramelised onions, juicy mushrooms, thick tomato slices, Swiss cheese, aioli, and mesclun greens. Foundry flame grilled beef patty, lightly grilled pineapple, American cheddar, salad mix, Kewpie mayo, aioli, and teriyaki sauce. Spicy = Picked jalapenos, sriracha sauce. Foundry grilled beef patty with double melted cheddar, crispy bacon, in house caramelised onion, aioli, topped with swirl of BBQ sauce. Mild spice. Sweet potato, chickpea patty, and caramelised onions. Topped with cashew nuts, tofu, coriander, aioli, tomato salsa, chipotle sauce, avocado, and mesclun greens. It contains gluten. South Australian field mushroom burger patty, thyme, and onions. Topped with thick tomato slices, sweet beetroot, aioli, and mesclun greens. Ingredients may contain egg. Slow cooked to perfection. Marinated with Foundry spices and coke. Ten chicken wings, with choice of flavour. Spices & beer battered wedges served sweet chilli and sour cream. Mozzarella and bacon tater tots. Made with 100% Australian potatoes with Foundry ground sea salt and spices. Ten chicken breast nuggets, served with sauce of your choice. Mesclun greens, tomatoes, cucumber, Spanish onions, and avocado with balsamic dressing. Mesclun greens, tomatoes, cucumber, Spanish onions and avocado with balsamic dressing. Topped with flame grilled Caribbean spice marinated chicken fillet. 150mL Gelista single serve jars.